And in spite of that meaning triple digit weather here in Phoenix, it is tied for my favorite month. 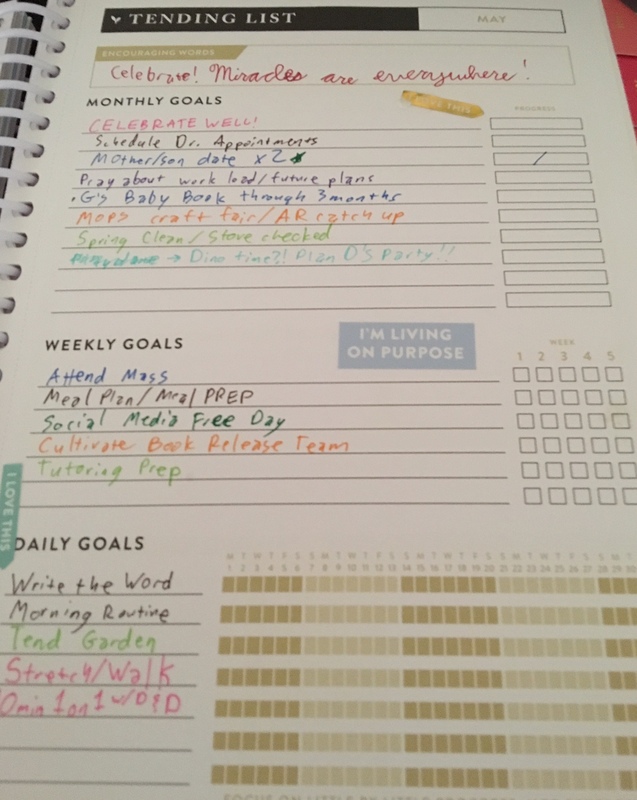 So I figured this would be a good month to give you a little more in depth look at my goals for the month and how I use my Powersheets! Plus, a sneak peek at the exciting things coming up this month. 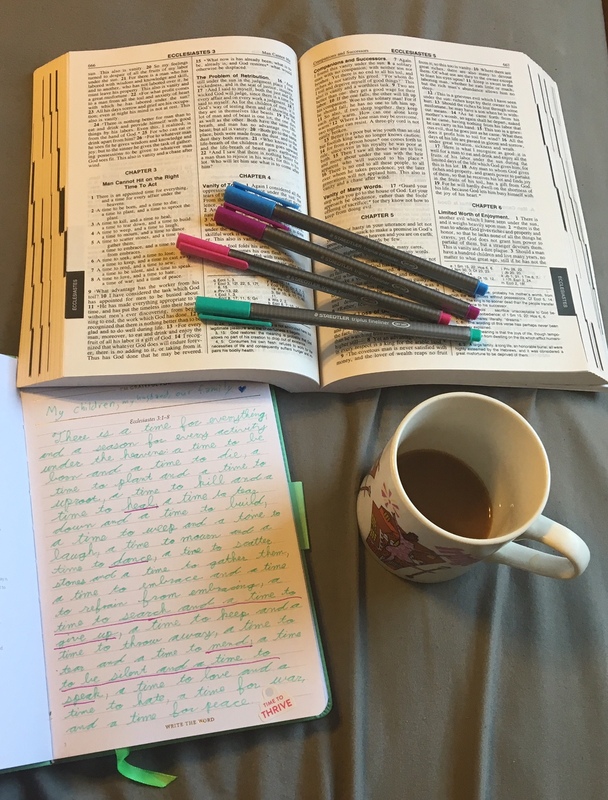 *Write The Word: This is a Bible study tool that is also from the Cultivate What Matters shop and I am really loving it. It gives you verses to look up and then you literally just write the verses in your own hand. It is a great way to get into God’s word amides chaotic children. After you write the word there’s space to reflect, as well as spaces to list a focus/intention for the day and what you are thankful for- I have discovered that what works for me is focusing for two days on one verse- Writing the verse out one day and highlighting pieces that stand out and then writing a reflection the next day after I’ve glanced back at the words several times. I am working through the renewal journal right now, but they have a whole set available to take you through the whole year and I know I will be using a few more collections before the year is out! *Morning Routine: I’m trying to establish a routine with some basic, important pieces for even the hardest mornings. I won’t lie, my favorite part of the routine includes “Coffee and God” but I’m also trying to get in the habit of re-setting the laundry situation and making the bed. *Tend the Garden: Because the heat is coming and missing a day of watering/caring for our plants could have a major impact. But also because my son LOVES this daily activity and it has become a really wonderful, special time for the two of us! *Stretch/Walk: This is going to be difficult as the weather gets warmer, but I’m hoping to squeeze in morning walks with the kids before it gets too toasty. And while I’m hoping to go to yoga classes more, I have found that it’s important for both my body and my mind to stretch a bit each day… even if that means a toddler climbing on me when I go into child’s pose or if I have to do downward dog while making faces at my baby below me. *1 on 1 time with D&D: nope, not dungeons and dragons… time with my two boys- my husband and my son. And eating or watching TV at the same time doesn’t count! With the baby it is HARD to accomplish this daily goal sometimes but I’m finding that it makes all the difference. 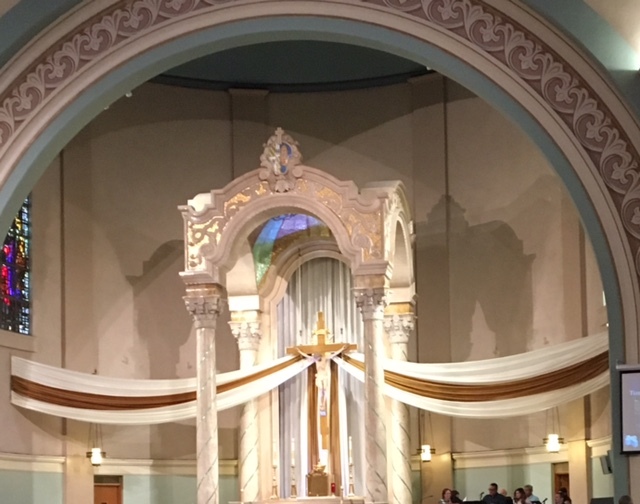 I LOVE the way our church is decorated during the Easter Season. And I love the way my toddler picks up on the changes too! *Attend Mass: I know this should be automatic habit by now, but we lost quite a few weeks of going together as a family when I was sick during my pregnancy and it has been HARD to transition to getting both kids together and out the door on time, so I want to keep this goal visible and know that it IS an accomplishment right now, even though I want it to become a no thought about it needed type of habit again in the future. *Meal Plan and Meal Prep: The past couple of months I’ve had meal plan under my weekly goals and it has helped, but weeknights are getting busier to we need to start preparing for the week ahead of time again. *Social Media Free Day: I have a love/hate relationship with social media and I think one way to evaluate how to use it well is to choose one day a week to sign off. Then I can lean in and enjoy the connections on other days (though I’m trying to limit it around the kids and make sure I have active, engaging, screen free times with them on a daily basis!). *Cultivate Book Release Team: This is one of my exciting new things- I get to help launch a book that I am SO excited about. The book Cultivate is on preorder now and it is going to be a phenomenal read. I am so excited to help spread the word as well as share some gorgeous phrases and passages from the book in anticipation of the launch date. I am also thrilled to connect to other women/bloggers/podcasters who are on the team with me. Much more about this in the month to come! *Tutoring Prep: One of the big transitions this month is that I’m going back to working part time. And since it has been so long (a whole year!) since I tutored, I need to set aside time to refresh myself on the materials so I can bring my A game to my students! Hoping this will help us with our bigger goal of paying down medical debts from our daughter’s birth. *Schedule Doctor Appointments: This goes along with my goal of self care and also things I haven’t been adulating with very well. I have several different doctor appointments to schedule for myself and my kids and I want to encourage my husband to schedule some as well so we can all be sure we are doing everything we can to stay healthy! I am a total procrastinator on this so I needed to write it down and share it for some extra accountability. *Mother/Son date x2: aside from my daily time with my son, I want special one on one times out with him. When my daughter gets older I will shoot for the same special time together. Maybe this means a try to a splash pad or maybe this means grabbing a quick ice cream from McDonalds, but the one on one time is what matters. *Pray about work load and future plans: I cherish being able to stay home with my kids, but I also love giving my talents back and using them in a job situation. It is hard to know what opportunities to say yes to or help create and now that we are getting towards the halfway point of the year it is time to look ahead and prayerfully reconsider how to balance my time. *MOPS craft Fair/Alphabet Resolutions catch up: Remember my Etsy shop? It’s been in vacation mode since December and I thought I’d be ready to start again in February… so… time to play a little catch up. Luckily, my mom’s group is having a craft bazaar just in time for Mother’s Day so that’s been a nice little nudge to create some really fun products over the past month I can’t wait to share! *Spring Clean/Stove Checked: This one… is a lofty goal and one of the most difficult to think of tackling. It is hard to keep up daily cleaning right now, let alone deep spring cleaning. Luckily, the monthly goals don’t get checked off, they have progress bars so even if I just make some progress I can remind myself that step by step is better than giving up all together. The stove is basically making sure we use our home warrantee well- especially since it is a gas stove we want to make sure everything it tuned up and working correctly. *Plan D’s Birthday: I can’t believe my little boy is going to be three!! His birthday is always a little tricky since it falls during Memorial Day Weekend, but I think it will be a fun time and I can’t wait to plan some more of the details. THIS POST CONTAINS AN AFFILIATE LINK, SO IF YOU BUY A PRODUCT THROUGH THAT LINK, I GET A SMALL PERCENTAGE. HOWEVER, I HAVE NOT BEEN PAID OR RECEIVED ANY COMPENSATION TO WRITE THIS POST AND THE VIEWS IN IT ARE 100% MINE. TO PUT IT SIMPLY: I JUST LOVE THIS COMPANY AND WANT TO SHARE IT WITH THE WORLD!